While my cousin was loading 9 x 19 mm , the last 1 or 2 cases in the clear plastic case feeder tube , would fall over , when they came out of the tube . We had this problem with .223 , but .223 is just barely with in the capability of the case feeder system . .45 ACP did not do this . Even when using the short slider . Anyone else experience this ? Have a mod to correct it ? Also , we used the penny mod . And the same with a dime . Still had a few upside down 9 x 19 mm cases . Seems like there is another mod , but can not remember ? I have a mod coming out to correct the last case issue. I call it a tip-stop. It is basically a spring that acts as a gate, holding the cases in against the case slider until they are pushed into the shell plate. 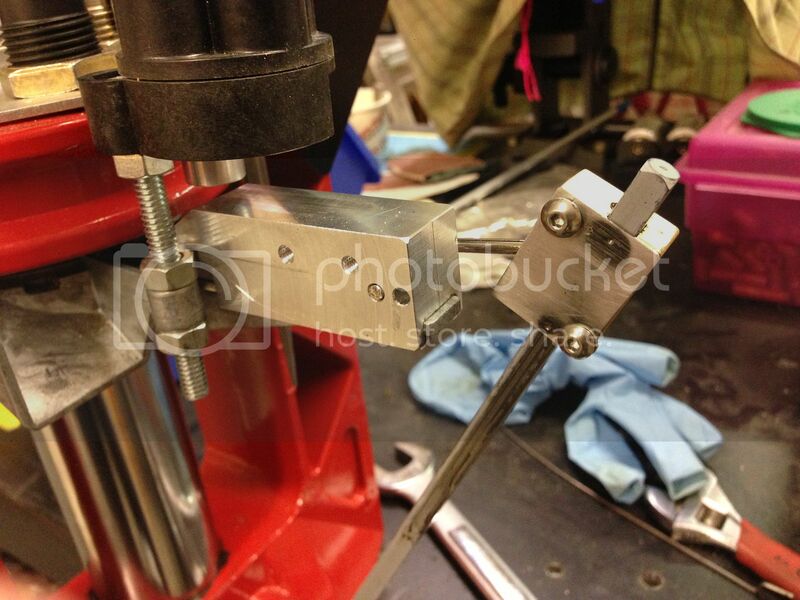 It attaches underneath the first case retainer and requires no modifications to the press. Keep an eye out here, they are coming soon. Last edited by websterz on Tue Feb 16, 2016 8:40 pm, edited 1 time in total. Could you please send me a photo when you get it ready to sell . heres two of websterz mods, dont be home without em! I want have another loadmaster without websters products. l will let him show the drunk case stopper. How does one see a list of these Webster products? Website? For tipped cases, at least in 9mm, I found it was the case feeder being just a bit high. Lower a thread at a time to find the sweet spot. For the collator, I've been using tygon tubing inserts in each tube. I still have the occasional upside down case, but not very often. Jim_Duncan wrote: How does one see a list of these Webster products? Website? You see 3 of his in pics above, vertical slider (cant never remember name of that thing/rides on vertical rod)/case feed slider/& the piece for collator. He also has spring catcher things for cases/ he'll show that. just pm him/he want bite/ may shoot at YE though! I load alot of 380/9, his spring thing for case tipping work on all cases including last one. Sometimes the lil 380 cases would get aggravating without his mods. If you want smoothness and feel in your hands, get his stuff. Not sure he is real. Last edited by THRASH on Mon Mar 14, 2016 4:04 pm, edited 1 time in total. Indeed I am real. I have not added the Loadmaster parts to my website yet as I am still building fixtures for machining the components. I will be putting them on there very soon though. Had the same problem primarily with 9mm. This post prompted me to go look at the set up again. Found the feeder set too high and off center. Corrected the setup and problem solved. GhostlyOne wrote: Had the same problem primarily with 9mm. This post prompted me to go look at the set up again. Found the feeder set too high and off center. Corrected the setup and problem solved. websterz wrote: Indeed I am real. I have not added the Loadmaster parts to my website yet as I am still building fixtures for machining the components. I will be putting them on there very soon though. Please tell us where this website is, thanks.